Rebecca Sugar (born July 9, 1987) is an American animator, director, screenwriter, producer, and songwriter. She is known for creating the Cartoon Network series Steven Universe, which has made her the first woman to independently create a series for the network. Sugar was formerly a writer and storyboard artist on the animated television series Adventure Time, until 2013. Her work on the two series has earned her five Primetime Emmy Award nominations. Sugar was raised in the Sligo Park Hills area of Silver Spring, Maryland. She simultaneously attended Montgomery Blair High School and the Visual Arts Center at Albert Einstein High School (where she was an arts semifinalist in the Presidential Scholar competition, and won Montgomery County's prestigious Ida F. Haimovicz Visual Arts Award), both of which are located in Maryland. While at Blair, she drew several comics (called "The Strip" for the school's newspaper, Silver Chips) which won first place for comics in the Newspaper Individual Writing and Editing Contest. "The Strip" ran a comic challenging MCPS's new grading policy from 2005. She went on to attend the School of Visual Arts in New York. According to Sugar's father Rob, Rebecca Sugar and her younger brother Steven were raised with what he called "Jewish sensibilities". Both siblings observe the lighting of Hanukkah candles with their parents via Skype. She is also a descendant of a Holocaust survivor. During her time at the School of Visual Arts, Sugar directed short animated films, including Johnny Noodleneck (2008). In 2009, she wrote and animated Singles, in which frequent collaborator Ian Jones-Quartey acted as an assistant animator, assistant inker and voice actor on the project, while Sugar's brother Steven Sugar acted as an assistant colorist. Sugar completed this film as her thesis. Sugar also played an important role in the creation of nockFORCE, a cartoon series created by Ian Jones-Quartey and Jim Gisriel and launched in 2007 on YouTube. In particular, she contributed to the cartoon's backgrounds and characters. In 2010, Sugar published her first graphic novel, Pug Davis, featuring an astronaut dog and his gay sidekick Blouse. She is also known for her comic "Don't Cry for Me, I'm Already Dead", a story about two brothers whose shared love of The Simpsons takes a tragic turn. Sugar first joined the crew of Adventure Time as a storyboard revisionist during the show's first season. Due to the quality of her work, within a month of being hired she was promoted to a storyboard artist, making her debut during the production of the second season. Her first episode was "It Came from the Nightosphere". Production for Steven Universe began while Sugar was still working on Adventure Time. She continued working on Adventure Time until the show's fifth season, whereupon she left in order to focus on Steven Universe. Her last episode for Adventure Time was "Simon & Marcy"; following that episode, working on both series simultaneously "became impossible to do". She had also previously encountered difficulty in the production of the Adventure Time episode "Bad Little Boy". Sugar returned temporarily to write the song "Everything Stays" for the seventh season miniseries "Stakes". A teaser for a Steven Universe television movie, called Steven Universe: The Movie, was released during San Diego Comic-Con in the summer of 2018. The movie is expected to be released in late 2019. Sugar has discussed the importance of creating LGBT representation and content, especially in children's entertainment. On Cameron Esposito's podcast QUEERY, Sugar stated "I want to champion LGBTQIA, all of it, content...in G-Rated, family entertainment. I want to do that forever". She also explained that the show has helped her come to terms with her own identity as bisexual and nonbinary. She believes that early and positive exposure to the LGBT community can help queer identifying children avoid experiencing shame in their own identities. Sugar designed the album cover of True Romance for Estelle, the voice of Garnet on Steven Universe. In December 2016, comic book publisher Youth in Decline featured Sugar's sketches and story notes for her unpublished comic Margo in Bed as issue #14 of the art/comics anthology series Frontier. In 2018, Sugar was featured on Gallant's 2018 R&B/Soul track TOOGOODTOBETRUE, along with Sufjan Stevens. 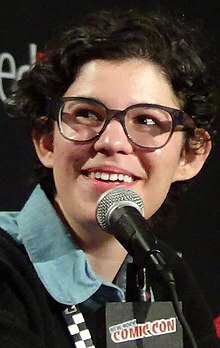 Rebecca Sugar's work on Adventure Time gained Primetime Emmy Award for Short-format Animation nominations for the episode "It Came from the Nightosphere" in 2011 and for the episode "Simon & Marcy" in 2013. The show also earned multiple Annie Award nominations. These included, Best Storyboarding in a Television Production in 2012 and Storyboarding in an Animated Television Production in 2013. For Steven Universe, Sugar has been nominated for several media industry awards, including four Primetime Emmy Awards. She and the series have received, among others, the 2018 Peabody Award for Children’s & Youth Programming and the 2019 GLAAD Media Award for Outstanding Kids & Family Program; in 2015 the series was named to the James Tiptree Jr. Award Honor List. In 2012, Forbes magazine included her on its "30 Under 30 in Entertainment" list, noting that she was responsible for writing "many of the best episodes" of Adventure Time. Variety included Sugar in "Hollywood's New Leaders 2016: The Creatives", a list celebrating upcoming filmmakers, showrunners and creators in both traditional and digital media. In February 2016, Ian Jones-Quartey confirmed via Twitter that he and Sugar were in a romantic relationship; at the time of the tweet, the two had been together for eight years. He added that they met when Sugar was at the School of Visual Arts in New York. In July 2016, Sugar said at a San Diego Comic-Con panel that the LGBT themes in Steven Universe are in large part based on her own experience as a bisexual woman. In a July 2018 interview on NPR, Sugar said that she created the series's Gems as "non-binary women" in order to express herself, as a non-binary woman, through them. As of 2019, Sugar uses both "she/her" and "they/them" pronouns. ^ a b "Rebecca Sugar – 30 Under 30: Hollywood". Forbes. December 17, 2012. Retrieved April 21, 2013. ^ Cavna, Michael (November 1, 2013). "'Steven Universe' creator Rebecca Sugar is a Cartoon Network trailblazer". The Washington Post. ^ "Two Students are Named Presidential Scholars". montgomeryschoolsmd.org. May 10, 2005. Retrieved October 22, 2016. ^ French, Esther (January 14, 2013). "Successful Animator Credits Einstein's Visual Arts Center". Patch Media. Retrieved April 25, 2017. ^ Goldstein, Jordan; Sekaran, Adith (November 14, 2005). "Silver Chips, Silver Chips Online, Silver Quill win in journalism competitions". Silver Chips Online. Retrieved October 19, 2017. ^ Amidi, Amid (October 5, 2012). "Rebecca Sugar Is Cartoon Network's First Solo Woman Show Creator". CartoonBrew. Retrieved June 11, 2014. ^ a b Moskowitz, Dan (May–June 2014). "Rebecca Sugar takes Hollywood by storm with hit cartoon show 'Steven Universe'". Temple Micah. Archived from the original on March 5, 2016. Retrieved March 1, 2016. ^ "Interview with Rebecca Sugar (MoCCa 2016)". Bubble Buddies. Tumblr. April 12, 2016. Retrieved June 14, 2018. ^ a b "The Weird, Heartbreaking Pre-'Steven Universe' Work of Rebecca Sugar". Hornet Stories. 2016-02-20. Retrieved 2018-10-25. ^ a b c "Cartoon Brew TV #21: "Singles" by Rebecca Sugar". Cartoon Brew. 2009-08-10. Retrieved 2018-10-25. ^ "ianjq on Twitter: "actually Rebecca helped a number of things in nockFORCE..."". Twitter. Retrieved 2018-10-28. ^ "Frederator Studios Blogs | The Adventure Time Blog | Rebecca Sugar's "Pug Davis"". archives.frederatorblogs.com. Retrieved 2018-10-25. ^ "Pug Davis". www.goodreads.com. Retrieved 2018-10-28. ^ Ward, Pendleton (2011). "Rainy Day Daydream" [Animatic commentary track], Adventure Time Season One [DVD], Los Angeles, CA: Cartoon Network. ^ Seibert, Fred (October 11, 2010). "Rebecca Sugar's First Board (Nightosphere)". Frederator Studios. Retrieved January 19, 2013. ^ Kohn, Eric (2013-11-01). "Adventure Time Writer Rebecca Sugar on Steven Universe, Being Cartoon Network's First Female Show Creator And Why Pop Art Is 'Offensive'". Indiewire. p. 1. Retrieved 2013-11-25. ^ "[Olivia Olson confirms when 'Stakes' will air]". Instagram. July 10, 2015. ^ "'Steven Universe: The Movie Release Date". Den of Geek. 2019-01-21. Retrieved 2019-01-21. ^ "Rebecca Sugar, episode #13 of Queery with Cameron Esposito on Earwolf". www.earwolf.com. Retrieved 2018-10-29. ^ Brown, Tracy. "Rebecca Sugar's commitment to LGBTQ visibility continues to drive 'Steven Universe' - Los Angeles Times". latimes.com. Retrieved 2018-10-29. ^ "'Steven Universe' creator is doing more for LGBTQ visibility than you might know". EW.com. Retrieved 2018-10-29. ^ "Rebecca Sugar on Twitter: "Ahh!!! Completely surreal experience of seeing my album artwork..."". Twitter. Retrieved 2018-10-28. ^ "[Frontier #14: Rebecca Sugar]". ^ "Adventure Time | Television Academy". Television Academy. Retrieved 2018-10-24. ^ "39th Annual Annie Awards". annieawards.org. Retrieved 2018-10-24. ^ "40th Annual Annie Awards". annieawards.org. Retrieved 2018-10-24. ^ Staff, Variety (2016-10-19). "Hollywood's New Leaders 2016: The Creatives". Variety. Retrieved 2018-10-24. ^ "ian jq on Twitter: "@CreeperGuy1337 yeah! We've been together over 8 years now"". February 13, 2016. ^ Mey (22 July 2016). "Rebecca Sugar is Bisexual: "Steven Universe" Creator Comes Out at Comic-Con | Autostraddle". Autostraddle. Retrieved 22 July 2016. ^ Johnson, Joshua. "The Mind Behind America's Most Empathetic Cartoon". 1A. NPR. Retrieved 13 July 2018. ^ Pulliam-Moore, Charles (16 July 2018). "Steven Universe's Rebecca Sugar Comes Out as Gender Nonbinary". io9. Retrieved 17 July 2018. ^ "Rebecca Sugar (@rebeccasugar) | Twitter". twitter.com. Retrieved 2019-01-14. ^ Sugar, Rebecca (November 25, 2012). "I did some storyboards for Hotel Transylvania!". Tumblr. Retrieved May 6, 2013.